At number 1 it’s revenge, getting your own back, having the last laugh, whatever you want to call it. Damon Hill, the former British F1 world champion, was one of the four FIA stewards at the Monaco grand prix who ruled Michael Schumacher’s last gasp dash past Fernando Alonso illegal. “The hate mail has started” said Hill, once the Schumacher fans realised who had had a part in having their favourite penalised. For those who remember 1994, however, Hill’s actions will seem perfectly justified. After a controversial crash in the final race at Adelaide, Michael Schumacher won the world championship by a single point. Check out the video footage of the famous altercation. At 2, it’s the stunning Mark Webber. Sector after sector, lap after lap, Webber notched up fastest, after fastest, after fastest, and won the Monaco grand prix despite a whopping 4 safety cars. At one point I questioned whether Webber was in the car at all, and in fact had been replaced by some highly-tuned machine. But no, the evidence suggests that Webber has in fact hit his F1-peak, much like we realised with Jenson Button at Monaco last season. After years of being known as the unluckiest man in F1, it’s about time Mark Webber had his moment. At 3, it’s crash! BANG! Wallop!! 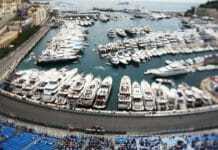 Only 12 cars made it to the chequered flag in Monaco this weekend, and the top 10 took home some valuable points. 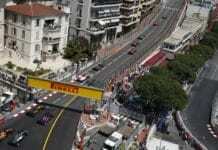 That means that half the grid crashed out during the eventful race on the streets of Monte Carlo. The first safety car was on lap 1 thanks to rookie Nico Hulkenberg’s smash in the tunnel, and then two more safety cars were caused by F1-veterans Rubens Barrichello and Jarno Trulli. Just goes to show that experience really doesn’t count in Monaco. From the photo above, it’s amazing that both Trulli and Chandhok walked out of their cars alive! The safety car I haven’t yet mentioned is also the most amusing. On lap 44 the SC flags started flying because … drum roll please … a drain cover was loose. Right. Sounds more like an SouthWest trains excuse to me. At number 4 it’s Martin Brundle’s love-in with the German reporter Tania Bauer. You may remember her as the one who Brundle is always elbowing out of the way in his quest for a driver interview. This weekend Brundle bumped into Bauer in the middle of the ‘tube station’-like Monaco grid, and thankfully this time they could both have a laugh about their frequent grid-meetings. Classic stuff. Number 5 of this week’s Badgerometer is the sprightly Fernando Alonso. To say that it’s hard to overtake at Monaco is frankly an understatement. However, Alonso kept us all hugely entertained at the beginning of the grand prix by daringly overtaking several other cars down into the Nouvelle Chicane. From starting in the pitlane, to finishing 6th, at Monaco no less, it’s impressive stuff from the former world champion. Sort it out! Making the mistake is bad enough, but they could at least agree on what the problem actually was. Mercedes also had a weekend to forget, with both mistakes in qualifying and the race. Nico Rosberg managed to hold up Schumacher in qualifying., scuppering both their races. “We cocked up” said Ross Brawn, boss of Mercedes GP. Too right you did. … and this just wouldn’t be a Badgerometer without some mention of the attire of Eddie Jordan. This week he surpassed even his own thresholds of bad taste by wearing a pair of eye-offending purple trousers, with matching purple glasses. And you thought the white jeans were bad enough. Next articlePodium or Pits – grand prix POP!